Which solution works for me? "When we needed to create a management application for our world-class iMSS switch integrated with Cisco Systems equipments, we turned to SimpleSoft. SimpleAgentPro simulated the complex scenarios we needed to manage and prepare for. We are very satisfied with SimpleAgentPro. " 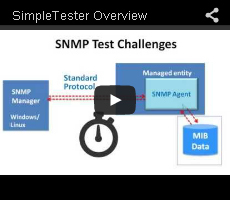 This short tutorial will give you an overview of SimpleSoft's Automated SNMP Agent Tester which can complete weeks worth of manual testing in just minutes. This short tutorial will show you how you can benefit from SimpleTester's Syntax testing that checks for MIB and protocol compliance. This short tutorial will show you how you can benefit from SimpleTester's Semantic testing that checks if the underlying instrumentation is correctly implemented. This short tutorial will show you how you can benefit from SimpleTester's vulnerability testing that checks if the agent is vulnerable to an SNMP based Denial of Service (DoS) attack. 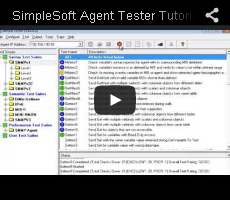 This short tutorial will give you an overview of SimpleSoft's Automated NTCIP Tester which can complete weeks worth of manual testing in just minutes.